BuzzShow Update: Announcing features update, events and alpha release on mobile. 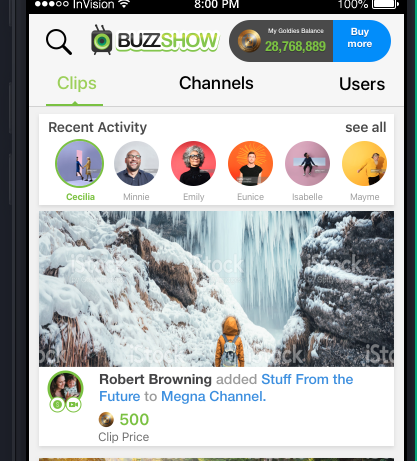 The alpha release was targeted at assessing the usability of the platform to enhance its potentials in order to reflect the core purpose of BuzzShow as a reward-based video social media platform. We've received a lot of feedbacks on the experience of our alpha users. These bordered on the overall functionality of the platform’s components and features. As a dedicated team, several of these concerns have been addressed, especially those relating to the user-interface and experience (UI/UX). My Channel: Addressed channels selection and channel details as well as issues with setting “my balance” to zero when creating a new channel. MetaMask API: Alert users if not on the Ropsten blockchain for the Alpha test. Transactions Page: The new update now shows transaction status as initiated by the user. Friends List: After adding or a accepting a friend invite, the new additions appears on a friends list. Gift Goldies Popup: Corrected issues with both “Send” and “Done” buttons showing at the same time. My Balance: Refresh to indicate balance real-time. My Earnings: Corrected display of earning values. BuzzShow will now be available on mobile from 15th August, 2018. The move to release our mobile app is part of the alpha testing phase and the product should be treated as such. The app will be available to both Android and iOS users. We would like to invite our community members and the members of the general public to try out the app and provide their feedback. Existing alpha users will be granted access to the app without further registrations, while intending new users are advised to visit our landing page to send in their applications. BuzzShow will feature as one of the main sponsors of this highly exclusive event. The congress is expected to have high profile investors in attendance. BuzzShow is one of the sponsors of the event. The BuzzShow team will be presenting their vision to attendees and potential investors. The event will be featuring experts from the Blockchain, Fintech and Cybersecurity industries. Also, the Maltese Prime Minister, Hon. Joseph Muscat will be keynoting at the event. We invite you to visit our dedicated booth at the main hall to interact with the team. BuzzShow will be showcasing at the event as one of the chosen promising start-ups. The event will feature high net-worth individuals and chief executives from around the world. Further details about these events and other road shows will be made available in subsequent publications. Contact us via roadshow@buzzshow.com to set up possible meetings at any of these and other events. The team is committed to BuzzShow’s development. We will like to keep you updated with news as they break. Join us on Twitter, Facebook, Telegram and Reddit to stay up to date.